Megan Kaminski’s first book of poetry is Desiring Map (Coconut Books, 2012). She is also the author of seven chapbooks, most recently Wintering Prairie (Dusie Kollektiv, 2014), which was recently reissued by above/ground press. Her current work Deep City explores the body and the city as architectures in crisis. She teaches creative writing and literature at the University of Kansas and curates the Taproom Poetry Series in downtown Lawrence. 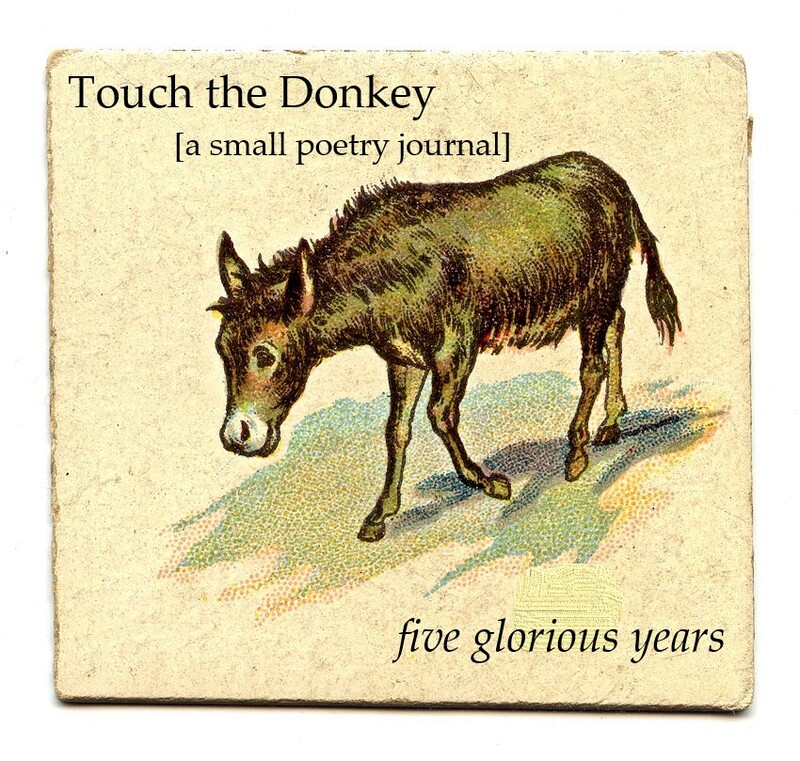 Her piece “Sister // Deer” appears in the third issue of Touch the Donkey. Q: Tell me about the extended poem “Sister // Deer.” How did it originate? A: My second book, Deep City, is going to be coming out next year—I’ll have an official announcement soon—and “Sister // Deer” is part of my new/current project Gentlewomen. The poems in Gentlewomen play around with and revise gendered domesticity through a re-imagining of the voices of female allegorical figures, specifically Natura, Providentia, and Fortuna—giving voice to particularly feminine desires and appetites. The poems consider the kinds of wildness and incivility that arise from a rejection of various forms of cultivation. They also celebrate feral longings and weedy appetites as counterforces to productivity and as a means of reclaiming the wild. As I’ve been working on the project, I’ve become particularly interested in sisters and the idea of sisterhood, in the relation of the allegorical figures to each other and also the relations of the various other women who inhabit the book—lost girls, icy mothers, drowned and ghosted children, and also the two sisters who get their own long poems, “Dear Sister” and “Sister // Deer.” While “Dear Sister” and her correspondences (there’s an excerpt here at Two Serious Ladies) live very much in the suburban domestic sphere, “Sister // Deer” rejects that world. While I think of her poems very much as spoken utterances, as a kind of response to her sister, they are also language eroded through a kind of self-erasure. A resistance to pleasantries and the types of usefulness and meaning that create the language of her sister. The poems aren’t conventional utterances, and they aren’t the type of responses one might expect to correspondence, and “Sister // Deer” herself perhaps isn’t quite human. Q: Is this a normal part of your composition process: writing around and through a particular subject/idea? A: I don’t typically start out with a particular subject—at least not an encompassing and defined subject. In this case I started thinking broadly about voice, examining and playing around with the authority of voice and questions about who gets to speak/who gets to be heard. I’m particularly interested in how these questions play out along lines of gender, class, race, and ecological systems. So I guess I had these set of concerns in mind when I started writing. Gradually the voice of Natura came out in the poems—this loving and at the same time brutal mother and sister. That voice developed in the poems, and as I was writing, I started doing research—a whole ton of research. Research into literary history, literatures and theories of the feral, various ecological systems, philosophical explorations of nature and fortune, and allegorical depictions of women throughout history. That research fueled my writing and the project. I guess this is how my compositional process always goes. For me writing poetry is a way of thinking, about the world, about language, about bodies, about architectures, about capital, about how they all fit together. I’m always thinking, and I'm quite often writing, and every once in a while something comes along that coheres into something interesting enough to pursue as a creative/intellectual project. I’m always thinking and writing and doing research—only a small part of the work I create makes its way into the world. Q: You give the impression that you are very much working within the framework of the book as unit of composition. Is this a fair assessment, or do you focus more on the individual poem, or handful of poems? Are your books constructed as complete units or more as a collection of disparate parts that eventually cohere into larger projects? A: Sometimes I write a poem or poems and sometimes I work in larger units. I’m always looking for connections, ways in which poems are thinking through something. Sometimes that thought works itself out in the duration of a single poem, though often the initial thread develops into something larger—a series or even a chapbook or book. I’m always looking to raise additional questions and to develop resonances outside of the initial moment or thought. Since I’m hard at work on a book length manuscript, I am currently very much focused on the form of the book. That said, each book manuscript that I work is part of a larger process of inquiry. The book-to-be, Gentlewomen, is only a small part of the larger intellectual/creative project. There are other writings and creations associated with the project, different ways of thinking through some of the material and ideas that are coalescing into the book manuscript. Some of the writing and research associated with the larger project has developed in the form of book reviews, poetics papers and talks, somatic exercises, and even a textile project. And there’s also a lot of research and writing and thinking associated with the project that will never make its way into the larger world. I’m not so interested in being efficient or productive in a way that is readily recognizable, each book manuscript is only a small part of what I am up to. Q: What else are you up to? A: Besides the book manuscript I mentioned earlier, I’m working on a few scattered projects. I’m writing some poems about weeds, bodies, connections, and riots and some poems about the prairie. Working on a lost girls embroidery project. Working on a collaborative project with the poet Bonnie Roy. Reading and thinking a lot about the post-human, citizenry, bodies, crisis, incarceration, revolution, and other things for a residency I’m participating in Joshua Tree. And also thinking about all these things in connection with the poems I have been writing about weeds and weedy connections. Q: Tell me about this upcoming residency: does this mean you’ll be working on a specific project involving “the post-human, citizenry, bodies, crisis, incarceration, revolution, and other things” while there? What are you imagining this project might look like, or are you still in the preliminary research stages? A: It’s through the Summer Forum for Inquiry + Exchange, which is a roving residency program in its second year/incarnation, this summer in Joshua Tree, California. This year’s theme is “Networks of Belonging: Geographies, Citizenries, and the Masses,” and there will be residents, invited guests, and organizers all getting together to collaborate through readings, discussions, presentations, and art-making. I’ve been working my way through the extensive reading list this spring and summer and also making connections through other research that I have been doing on my own. This coming week, we’ll all be together in Joshua Tree. I’ve never participated in something like this before, and I’m excited about the ways in which the residency connects with my previous and current work. I’m also excited about the generative possibilities of this week-long exchange in Joshua Tree and the ongoing exchange after. I’m guessing that this will be the start of something new for me in terms of a poetic project. Mostly though, I’m excited about being a part of a larger community of artists, philosophers, and writers, with all of us exploring and grappling with these larger questions. Writing can sometimes feel like an isolating experience, even if what drives you in your writing is a desire to connect. Q: After one poetry collection and a small handful of chapbooks (as well as this current work-in-progress), how do you feel your work has developed? What, if anything, do you feel you are working toward? A: I don’t really think of my work in a narrative of progress—so there’s not really a goal or an end that I am working towards. When I first start conceiving them, my individual book and chapbooks projects feel like they are doing quite different things—experimenting with different voices, forms, subjects, etc—but as I spend more time with each of them, I see connections. I continue to be interested in various geographies and architecture—of the natural and made world, of the mind, of the self, of language, of larger systems and networks. Though, I suspect that describes a pretty broad and encompassing field of inquiry. Q: Winter seems to be a thread that exists through your poetry. What is it about the subject that compels? A: Well, this winter was particularly rough in Kansas, as for much of the country. My recent chapbook, Wintering Prairie (Dusie 2014), is a long poem devoted to exploring the season and how it mediates our relation to place, specifically the prairie that spreads across Kansas. Besides that poem, I’m not sure if winter is more central to my writing than any other season. Though, I am often surprised and startled by the length and intensity of the season, and perhaps summer, too, after spending so much time in more temperate places. Q: Finally, who do you read to reenergize your own work? What particular works can’t you help but return to? A: Oh—there are so many! Some current and sustaining favorites include Marilynne Robinson’s Housekeeping, Leslie Scalapino, C.S. Giscombe (especially Giscombe Road), Renee Gladman’s Ravicka series, Fanny Howe, Joseph Massey, Terry Tempest Williams, Bhanu Kapil, Erín Moure, Giorgio Agamben, Michael Palmer, Jennifer Moxley, Gina Myers, Jen Tynes, Ji Yoon Lee, Melissa Buzzeo, Pattie McCarthy, Joshua Clover, Cecilia Vicuña, Michelle Naka Pierce, Stephen Collis, Lisa Robertson—so many wonderful writers. And that’s just who’s on the top of my mind this morning.